Turkovich Winery and Winters Cheese Co. Located in the small town of Winters, California, Turkovich Wines is a family-owned winery that produces some of the finest wines in the region. Known especially for “The Boss”–a unique blend of Petite Sirah, Syrah, Tannat, Petit Verdot, Malbec, and Cabernet Sauvignon–at Turkovich Wines you’ll find an impressive array of varietals to pair with all of your favorite meals. Turkovich also operates the Winters Cheese Company out of their downtown tasting room, where you’ll find locally produced cheese to pair perfectly with Turkovich wines. For a complete list of Turkovich wine available for purchase, visit Turkovich Wines. Matchbook Wines is a family-owned winery located in the verdant Dunnigan Hills area of the Capay Valley, making wine with the philosophy that “fruit comes first, with oak flavors as a supporting element.” Matchbook Wines produces a range of varietals with “The Arsonist,” a blend of Chardonnay and Petit Verdot, as their claim-to-fame. We recommend the Holiday Sampler, which includes six different 750 ml wines for you to try (including a 2015 Arsonist Red Blend). For a list of all of Yolo County wineries and tasting rooms, visit our Wineries and Tasting Rooms page. Located in the breathtaking Capay Valley, the Séka Hills Olive Mill is Yolo County’s premier olive oil tasting room. Offering some of our region’s finest wines, olive oils, honey, beef jerky and seasoned nuts, Séka Hills is a great place to find unique, locally produced goods. We recommend the Seka Hills Sampler, featuring 100ml bottles of Premium Arbequina, Picual and Frantoio Extra Virgin Olive Oils and Elderberry, Fig and Pomegranate Balsamic Vinegars. You can even create your own customized gift box on the Seka Hills website. If you love imaginative, artisanal olive oil, Capay Valley Ranches is the spot for you. Offering unique infusions such as Blood Orange and Meyer Lemon olive oils, Capay Valley Ranches oils will undoubtedly enhance any dish. Create your own gift box of four 250ml Capay Valley Ranches olive oils or balsamic vinegars using their “Mix & Match” feature on the website. To learn more about Yolo olive oil and who produces it, visit our Olive Oil is the New Wine article up on the blog. 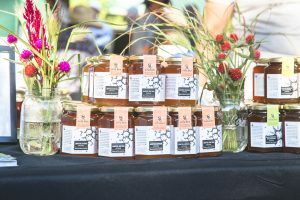 The UC Davis Olive Center and Honey & Pollination Center at UC Davis offer a wide variety of locally grown and produced honey, vinegar and other artisanal oils. New to their product line up are three delicious new vinegars—Barrel-aged balsamic, D’Anjou pear and Mission fig—and a new coriander honey (a.k.a cilantro). The UC Davis Honey Sample Set is the perfect gift for honey lovers, including 3 oz jars of their delicious Wildflower, Orange Blossom and Coriander honeys. Z Specialty Foods, operating out of Woodland, prides itself in selling local products made with simple, natural ingredients. Carrying brands like Moon Shine Trading Co., Cowboy Caviar and Island of the Moon Apiaries, at Z Specialty Foods you’ll find products like local honeys, butters and spreads, caviar, jellies, pollen and beeswax—all available for purchase online at Z Specialty Foods. For an in-person shopping experience, visit the 8th Annual Z Specialty Foods Warehouse Sale on Saturday, December 9th at 11 a.m. for discounted holiday gifts and products, plus special tastings and live music. Henry’s Bullfrog Bees & Pure Honey offers a variety of exquisite honeys harvested from local bees. Offering flavors and infusions such as Spring Blossom, Essence of Lavender, Habanero, Infused Cinnamon and Caramel, Pure Honey is the perfect addition to your morning meal. To shop Pure honey, visit their website or find them at the Davis Farmer’s Market. Started in 1861, Sola Bee Farms is the newest derivation of agricultural production on the Tauzer Family Homestead. Sola Bee produces a range of high-quality honeys, with flavors like Wild Blackberry, Yellow Star Thistle and Black Button Sage. We recommend the Honey Lover’s Trio, with which you can choose three of five delicious twelve-ounce honey varietals. Dubbed as “America’s Favorite Market,” the Davis Farmers Market is a great place to find Yolo-made gifts for the holidays. At each Saturday market in December, stop by the “Gift Basket Central” station to assemble a customized gift basket filled with Yolo County goods. The Davis Farmers Market Cookbook, written by Davis native and market-co-founder Ann M. Evans, is another great gift choice for the cook in the family. For more information about the market, visit Davis Farmers Market. Based in Davis, Poppy And Oak Goods assembles thoughtful, custom gift boxes with products made throughout Northern California. Each gift box comes in a handmade Poppy and Oak keepsake wooden crate with a custom, handwritten note—we recommend the charming Taste of Yolo Mini Box, which features Yolo Press olive oil, Eatwell Farms flavored salt, and Pure Honey. Shop all gift boxes on Poppy and Oak. Full Belly Farm is a certified organic farm that grows a wide variety of fruits, vegetables and flowers in the gorgeous Capay Valley. Full Belly Gift Boxes, available for purchase online, include an assemblage of Full Belly products like stone milled whole wheat flour, sun dried peaches, marmalade, syrups, yarn and wreaths—order by December 1st to guarantee your box. For the lavender lover in your life, the Cache Creek Lavender Farm is the perfect place to find luxurious spa, home and culinary products all made with lavender from the Cache Creek farm. Shop essential oils, perfume, bath salts, soaps, dryer bags, salts and teas at the Cache Creek Lavender Farm in Rumsey (3430 Madrone Street), or online at the Farm Store. For the book worm in your life, check out The Avid Reader in downtown Davis, where you’ll find an impressive selection of books and stationery goods. An Avid Reader Gift Card makes the perfect gift for those who prefer to pick out their own presents—you can load them with as little as $5 and as much as $200. RootStock specialty gifts, found inside the Berryessa Gap Vineyard tasting room, was started in 2008 to help market and recognize wineries in Yolo and Solano counties. In addition to delicious, locally made olive and walnut oils, cheeses, chocolates and honey, at Rootstock you’ll find a variety of high-quality glassware, Italian pottery and Spanish cookware that are sure to make perfect gifts this holiday season. Rootstock is located inside the Berryessa Gap tasting room at 15 Main Street in downtown Winters. The White Barn, a family owned and operated gift shop located in historic downtown Woodland, is your one-stop shop for vintage inspired home decor and accessories. Described as “prairie chic”—rustic, elegant, bright, and functional—find decorative items like wall hangings, candles, pillows, mirrors and much more at The White Barn, located at 510 Main Street. For eclectic, original gifts for the whole family, be sure to stop by The Gifted Penguin, a family-owned and operated gift shop located in downtown Woodland at 716 Main Street, Suite A. Packed with goodies like greeting cards, home decor, spa accessories, trinkets, knick knacks and all sorts of fun treats, The Gifted Penguin is a great place to get your shopping done during the holidays.